Courtesy of DEBORAH FUNARI HEALY. GORGEOUS GULF FRONT ESTATE WITH WIDE PRIVATE BEACH COMPLIMENTING ONE OF THE ISLANDS GRANDEST HOMES! PRIVATELY GATED & SITTING HIGH ON ONE HALF ACRE PLUS. A FABULOUS HUGE TEAK W/GLASS ENTRANCE DOOR OPENS TO A GRAND FOYER & DRAMATIC STAIRCASE! SOARING CEILINGS AND IMPRESSIVE CROWN MOLDINGS. FIVE BEDROOMS, FIVE BATHS PLUS GUEST QUARTERS & MORE. VAST PICTURESQUE WATER VIEWS FROM ALL THE STUNNING INTERIORS OF THIS SAND CASTLE! LIVING ROOM, DINING ROOM, AND GREAT ROOM W/BAR ARE ALL FLUID WITH ONE ANOTHER. LARGE KITCHEN OPENS TO A SCREENED LANAI FOR OUTDOOR ENJOYMENT. MASTER EN-SUITE OFFERS TWO MASTER BATHS & BALCONY OVERLOOKING GULF! 8220;ROOM AT THE TOP 8221; VIEWS ARE TOO BREATHE-TAKING TO DESCRIBE! ELEVATOR TO ALL FLOORS.PRIVATE ENTRY FOR GUEST QUARTERS. SCREENED IN POOL LOCATED ON GULF SIDE. FRENCH DOORS THROUGHOUT, GARAGE OFFERS WORKSHOP AREA, SEPARATE OUTDOOR STORAGE. SERIOUSLY, AMAZING GRACE!! 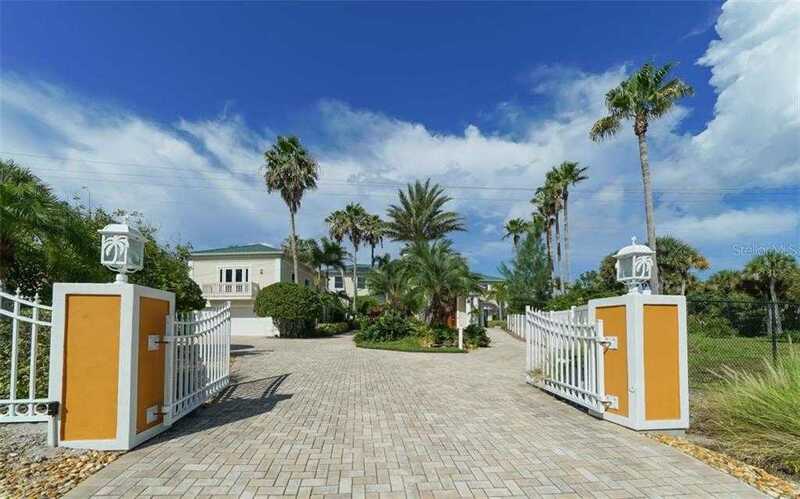 Please, send me more information on this property: MLS# D6101976 – $3,650,000 – 8240 Manasota Key Rd, Englewood, FL 34223.